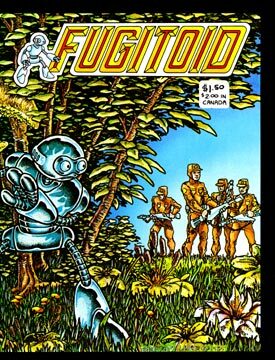 The first (and only) issue of Fugitoid was Mirage Studios’ first comic book to feature a full color cover. The story begins as Dr. Honeycutt is working on his Mentawave Helmet, a telekinetic device that the scientist has invented. The doctor’s experiment with the helmet is interrupted by a telecom call from General Blanque, who berates Honeycutt for not getting any work done on the Transmat device. The General informs Honeycutt that he will be arriving at 1500 hours and he expects to see some results. Dr. Honeycutt laments the General’s desire to turn the teleportation device into a weapon, and wishes that he could be like his mindless worker robot, Sal, but quickly rationalizes that if he were, he wouldn’t be able to make his inventions. Honeycutt begins his experiment anew and manages to move a plant with his mind. The doctor is ecstatic and then discovers something even more fantastic – the Mentawave Helmet allows him to pick up Sal’s thoughts! Apparently the robot is in some kind of duress, he’s been entangled in some cables outside and can’t get loose. So the good doctor goes out to free his assistant. As Honeycutt works at getting Sal unstuck from the cables, a downpour begins. The doctor helps the injured robot up and they head back to the base laboratory when they’re struck by lightning! When Honeycutt awakes from the trauma, he finds that his mind has been fused into Sal’s electronic brain! Doctor Honeycutt is now trapped inside of Sal’s metal body. Be careful what you wish for, eh? To make matters worse, General Blanque shows up with some troops and finds Honeycutt’s dead body. They determine that the robot Sal must have killed its master, and so they begin firing at Sal/Honeycutt. The doctor tries to explain, but the soldiers continue firing and he is forced to flee, thus becoming the Fugitoid. While the soldiers chase the Fugitoid through the woods, Blanque searches the lab for clues. He finds Dordogne’s taped reports and learns the truth. The General decides that this is a great boon, as he can now force the robotic Honeycutt to do his bidding and create the Transmat as a weapon. Since robots have no rights, Honeycutt won’t be able to protest or prevent how the Transmat is utilized once the work is completed. General Blanque orders his men to capture the robot in working condition, which doesn’t please the men, as it makes their work “twice as hard.” Meanwhile, the Fugitoid has met a group off huge, sentient and telepathic crustaceans who hide him from the humans. Once the men have left, the crustacean who concealed Honeycutt tells him to flee to the city Peblak, where he’ll be safe from the soldier’s sensors. The Fugitoid agrees that this is a good plan and heads off to the city, thanking the crustaceans for their help. Meanwhile, the soldiers report back to Blanque about their failure. The General orders them to wait at the lab to see if the robot returns, and then heads off in a shuttle to his home base. All the while Blanque fantasizes about becoming the most powerful man in the universe once he has the Transmat in his hands. The Fugitoid makes it to the city junkyard, but is captured by some robot scavengers. General Blanque is back at his base heading up the mission to locate Honeycutt. His trusted assistant, Lonae, asks him why the robot is so important and the General confides in her the powerful military potential of the Transmat and his desire for it. Lonae then heads to the alleys of the city and sneaks into a darkened building. It turns out the Lonae is a drug addict who sells military information to the Triceratons to get her fix! The Fugitoid is sold at an auction. As his new owner is taking him to a hovercar, Honeycutt makes his escape. The Triceraton who buys the information from Lonae now knows about the Transmat and he realizes how it could help his people win the war against the Federation. The saurian alien then proceeds to kill his non-Triceraton assistant and Lonae (via poisoned drugs) so he can be sure that there are no information leaks regarding the Transmat. Honeycutt is now seen fleeing from troops through a crowded market. The Fugitoid is cornered by the soldiers when suddenly four figures emerge from thin air… four Teenage Mutant Ninja Turtle figures! The story is continued in TMNT #5!